Travertine tile is considered suitable for a variety of architectural styles and is recognized for its timeless beauty. Travertine, a warm honey-colored natural stone quarried for thousands of years, continues to be chosen by some of the world's best-known architects and designers. Because travertine is abundant, weighs less than marble or granite, and is comparatively easy to quarry, it was the natural stone most frequently used by the ancient Romans. Famous structures constructed with travertine tile include the Colosseum, the Trevi Fountain, the colonnade of Saint Peter's Basilica, and many Roman aqueducts. Although obviously weathered by time, the fact that it is still in place attests to travertine tile’s great resistance and strength. Travertine is found in greatest quantity where hot and cold springs have been active for tens of thousands of years. Travertine is quarried in Italy, Iraq, Iran and Peru. The most famous travertine location is Bagni di Tivoli, about 12 miles east of Rome, where travertine deposits over 90 meters thick have been quarried for over two thousand years. Travertine is a limestone formed from the precipitation of heated aquifer waters and mineral springs when it rises to the surface. A thick, banded carbonate stone is built up over time as new dissolved limestone material covers older layers. The intricate texture of travertine is partially the result of gas bubbles, which are often sandwiched between layers of stone, creating voids. When travertine tile is to be used on the floor, these voids should be filled with an epoxy resin. Some installers use a grout to fill these holes but travertine tile can be purchased with the voids already filled with resin at the factory. As travertine is creamy colored, this resin may be opaque, of a creamy color, or transparent. The opaque filler does not reflect the light as well as the surrounding travertine, whereas the clear epoxy gives a three-dimensional appearance to the holes and takes on the shine of the travertine tile. Travertine tile possess a wide range of colors, and cover the spectrum from pure white to coral-red. The various hues of travertine tile can sometimes be constant throughout large pieces and at times are blended. Travertine tile displays distinct veins at times. It can be effectively polished to a smooth, shiny finish. Cross-cut – The travertine is cut with the grain of the stone bedding. This insures a more uniform color and texture often revealing a flowery, often circular pattern. Vein cut – which is against the bedding which reveals the bedding planes, making for a more blotchy, tiger-stripe effect when cut into tiles. Honed – the surface of the travertine tile is sanded to create a matte finish. Tumbled – the travertine is literally tumbled with gravel and bearings, giving it a rough-hewn, aged appearance. Brushed –the surface of the travertine tile is worn and textured by use	of a wire brush. Filled – The voids in the travertine tile are filled with colored epoxy resin or cement to produce a perfect, solid surface. 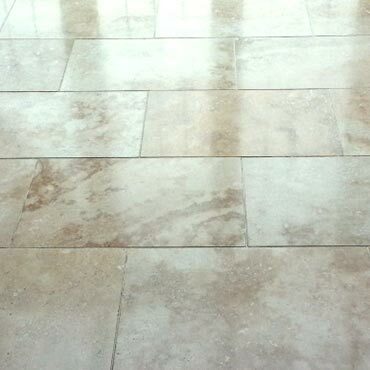 Polished – the travertine is sanded and polished, producing a shimmering look. A travertine tile floor is expected to last at least 50 years before replacement in high-traffic commercial areas. High-quality travertine is very durable, since it is formed at the earth's surface in relative equilibrium with the environment. Most other natural stones are formed under different conditions, deep underground.